I am Bhagya and I am fundraising for Thanseela, a student of my sister Lakshmi Bose from SNDP HSS School Udayamperoor. Before Scrolling Down, I want all of you to please STOP a while because a family is clueless on what is going on in their life and what to do next!!! 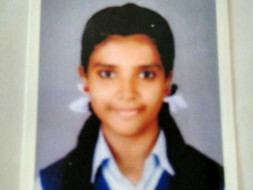 She is Thanseela, Student of My Sister Lakshmi Bose from SNDP HSS School Udayamperoor. 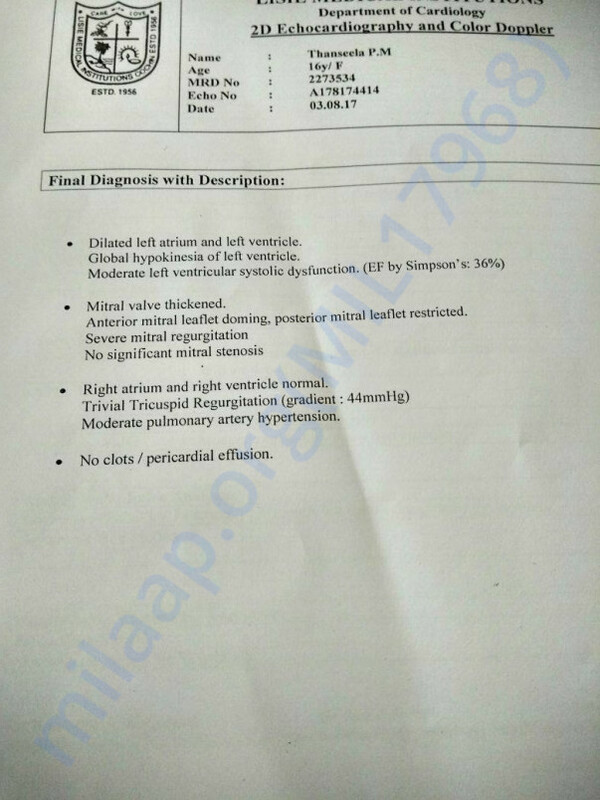 She is fighting a heart disorder and is in an urgent need of a surgery. Initial Surgery will Cost around 4.5 lakhs or may escalate up to 15 lakhs based on the findings in the initial surgery. Thanseela,currently survives with a family including the father (drives Auto on rent) and mother (already not well by health) and a grandmother (Aged enough to solely pray for the longevity of her granddaughter).Her father drives day and night to manage the expenses of her costly medicines and procedures. They already lost their house in pursuit of getting their daughter treated to her heart disorder from the age of three. They literally lack no other way in getting her treated as right now Thanseela is BEDRIDDEN! We cannot assure her life if not acted immediately. 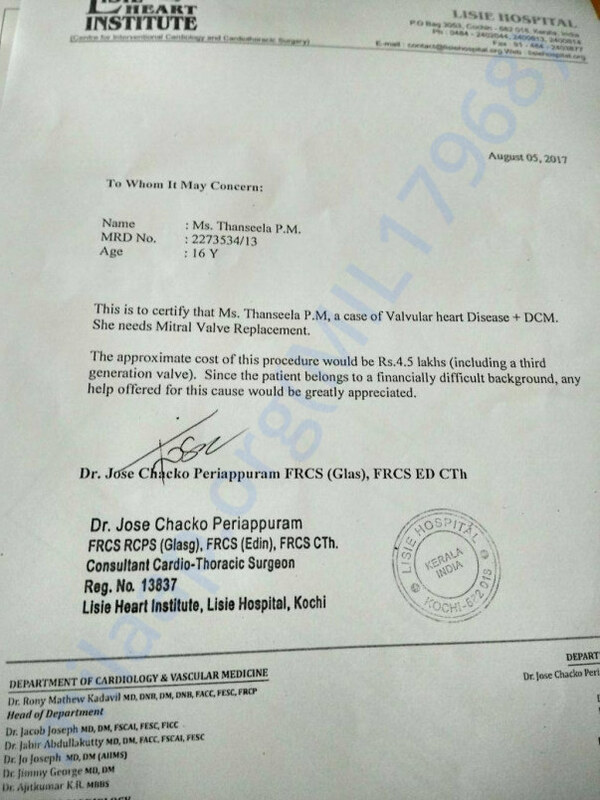 I want to also let you know that this is a GENUINE CASE as you can see the undersigned doctor is a famous Surgeon in Kerala (Dr.Jose Chacko Periyapuram-Surgeon who first conducted a heart transplantation Surgery in Kerala). Friends, daily we hear many such news –Might be more pitiless or dreadful. Even when she cannot wake up from bed she talks flawlessly on how she is going to face the board Exams. Such a bold girl should never be withered to the tantrums of fate this soon. We spend a lot of money which we cannot even remember where it all went. Let’s give those small savings as an answer to the folded hands of a helpless mother who is right now in a position to do nothing other than weeping on her daughter's pain. I am sure this will be counted once and nature will pay you back. Already Teachers and students have collected nearly 2.15 Lakhs and my heart goes out to appreciate them. I managed to collect her mother’s account details.I call upon all the well-wishers to pay your best possible amount in her account even if that means minimum possible denomination from your end. Because I tell you IT MATTERS!!!! This note goes to you all with extreme sense of gratitude and love to all my friends who supported a bold girl from losing a terrible battle with her own heart. When I and my sister decided to campaign for her , I was sure I would be able to collect a few thousands from my friends who will believe my words and will definitely help this child. But guys , I must confess that I literally underestimated you ...Within 10 days we saw phenomenal raise in our funds and I am still not able to believe my senses that Tanseela would be back to life with the help of a humoungous amount of RUPEES FOUR LAKHS (milaap fund Rs.153500 and her personal account is Rs250000) you all donated for her surgery to happen .I am so happy and proud of my dear friends who still find the last reason to keep that essential morale within you. 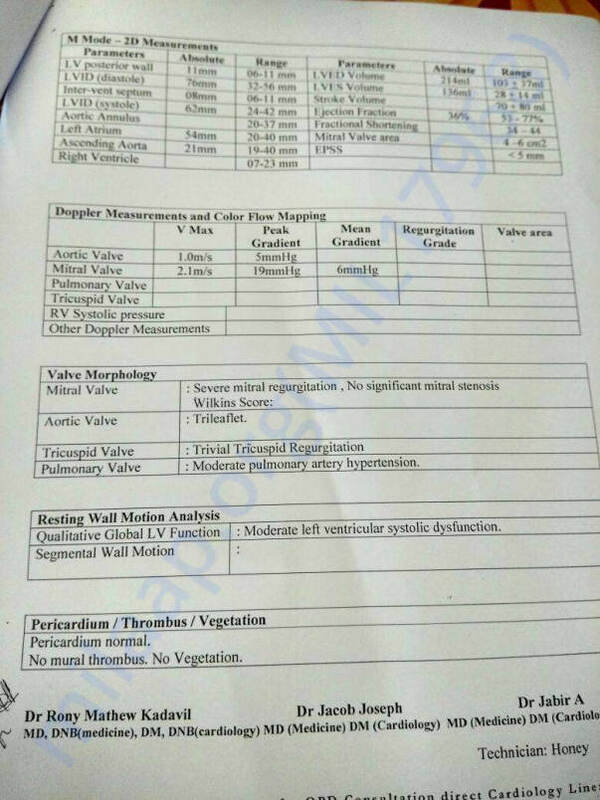 Thanseela surgery is scheduled on August 30th and she will be admitted to hospital on August 28th. She is right now undergoing pre surgical check ups and procedures. As just quoting the words of her mother, "I don't know who all have contributed for the life of my child. But I just pray to Him to give them everything because they were kind enough to help the people they didn't even knew". This is the prayer from the heart of a mother and I am sure this will be with you forever, no matter what . A big thanks to all the genuine hearts who all campaigned for Thanseela by forwarding the posts to their friends and also by posting the story in their own walls .I know many people who wired in money for her ;many people collected and contributed for her . I must tell you that every single penny from you got counted to this achievement. I hereby declare we are closing the campaign for Thanseela as we successfully met the money required for her surgery and other procedures. I request all your prayers and blessings for her speedy recovery.